They were able to taste the cocktail "Agua de Gelves" and several desserts made with bitter orange from the vega of our locality. 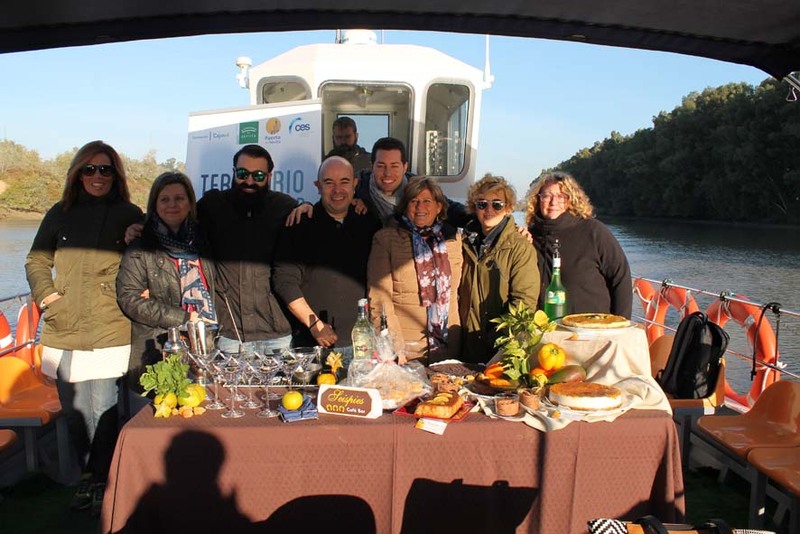 Gelves received on Friday, November 11, the visit of seven bloggers specialized in gastronomy, the most influential nationwide. The intention has been to know firsthand some of the dishes and drinks typical of our local cuisine. Specifically, a cocktail called "Water of Gelves" and some desserts made with bitter orange, so typical of our land. All this was served during a river ride from Puerto Gelves to the neighboring town of Coria del Rio aboard the "Trafalgar", a boat dedicated to tourist charters docked at our marina. Both the cocktail and desserts are the result of an initiative launched by the Tourism Delegation of the City of Gelves to promote gastronomic tourism in our town, which is getting to value the products and dishes typical of our traditional gastronomy. This measure is part of the project Guadalquivir Territory, promoted by Prodetur, Tourism of the Province of the Diputación, in which seven renowned bloggers are learning for several days the gastronomic and cultural offer of the municipalities that make up the Guadalquivir Territory. The cocktail, which can be taken very soon in the cafeteria Seispiés of Puerto Gelves, was prepared by the cocktail chef Mario Navas, several times champion of Andalusia, Spain, Europe and the World for his mastery of the technique in cocktails. The seven desserts and pies tasted have been made in the following establishments of Gelves, who will soon incorporate them to their cards for the enjoyment of all their clients. - CUP CAKES GELVEÑOS (THE COFFEE). The mayor of Gelves and responsible for the municipal area of Tourism, Isabel Herrera, wishes to show her gratitude to all the establishments in the town for having welcomed the initiative with such enthusiasm, incorporating traditional dishes such as "Cascote" and "Ajo Molinero", or using bitter orange in many of their dishes or desserts, adding an added value and differentiating our gastronomic and tourist offer. "A collaboration that joined the promotional campaigns planned in the immediate future will undoubtedly benefit the sector," says Herrera. Bloggers on arrival in Puerto Gelves, before enjoying the gastronomic walk along the river Guadalquivir. One of the bloggers relays live the impressions that give you to try the cocktail "Water of Gelves" in the middle of the river.